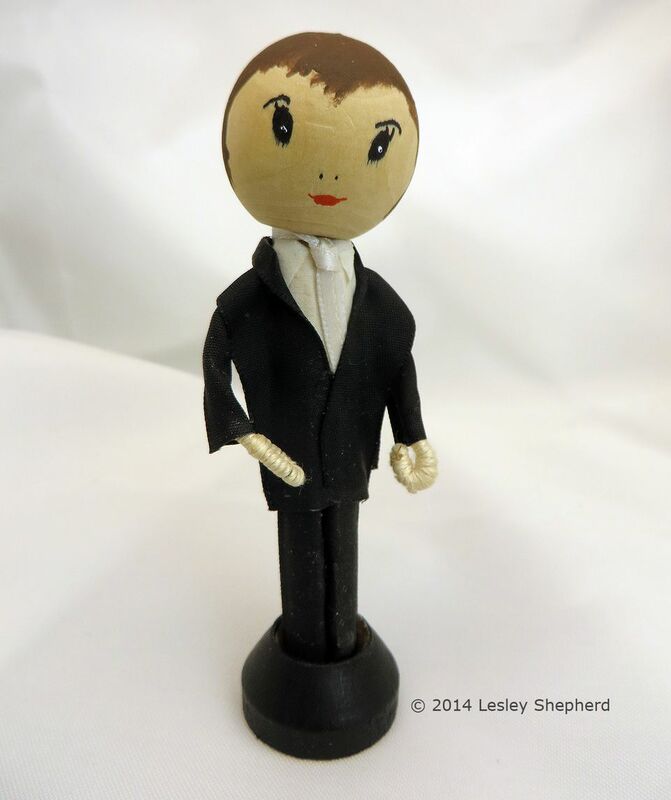 This clothespin groom doll or man in a tuxedo is made on a clothespeg and dowel doll body outlined in the basic clothespeg doll tutorial. As the doll head is left in natural wood, the arms have been wrapped in off white / ecru embroidery thread. The base ring has been painted with black semi gloss acrylic paint. If you prefer a doll head finished with 'hair' see the tutorial for the clothespin doll in kilt and velvet jacket. To make the tuxedo for my doll I used a length of 1/2 inch (1.25cm) black satin ribbon. I used the 'wrong' or flat side of the ribbon as the outside letting the satin side form a rolled shawl collar. The tie is made from a short length of 1/8 in. satin ribbon, while the shirt front or dickey is made from a scrap of cotton lawn fabric. The clothing can be glued or sewn onto the doll. For more clothespin doll costumes see the list of clothespin doll tutorials There are instructions for a bride doll as well as dolls in kilts, summer shirts and shorts, a sari, Nigerian dress, Japanese Kimono and baby dolls. As these dolls are roughly 1:12 scale, they can be paired with any of the dollhouse miniature projects as accessories. White doves in a bird cage for example. With the doll body assembled and arms fitted (see basic clothespin doll instructions) the clothespin groom doll's is given tuxedo trouser legs made from lengths of satin ribbon. Each leg will need two sections of ribbon which are glued so the seam of the two ribbons runs down the center of the outside leg. This will give the effect of a tuxedo stripe on the trousers. If you prefer, you can use the same method to dress the groom in a formal grey suit or tails using grey ribon or fabric and this method. To start, cut two lengths of 1/2 inch (1.25cm) ribbon for each leg. Finish the cut ends of the ribbon with pva glue or Fray Check to keep the ribbon edges from unravelling. Apply a small amount of fabric glue or pva glue to the shiny side of the satin ribbon and glue the edge of the ribbon down the outside center of the doll's leg. Apply a bit of glue to the other edge of the same ribbon strip and set it inside the clothepeg leg opening, running a credit card or a glue spreader along the inside leg to hold the ribbon in place. Apply the second ribbon strip to the back of the doll's leg, gluing it carefully along the center line of the trousers formed on the outside of the leg by the first section of ribbon. If possible match the ribbon strips edge to edge instead of overlapping the leg seam. Take care when working with the ribbon to apply only as much glue as necessary. Extra glue may bleed through the ribbon and mark it. Fold the strip of fabric in half lengthwise and cut a semi circle for the neck of the clothespin. Cut back from the neck hole to the lower edge on one side of the ribbon to make an opening. Fold the cut section of the fabric back against the uncut section with the neck edge and trim the cut half of the fabric to form two pointed collar edges. They are shown unfolded in this photo, and folded over the ribbon neck tie in the photo for step 5. In this photo you can see how the shirt dickey is glued to the front of the clothespin to form a shirt. I glued the collar edges down for the photo, but you will leave them unglued until the tie is in place. The arms for the tuxedo jacket on the clothespeg doll are lengths of ribbon cut to fit between the wrist of the doll and the doll body. Finish the cut ends of the ribbon with pva glue or fray check to keep the ribbon from unravelling. If you making a grey set of tails, or a suit jacket you can use the same method using different colored ribbon or lightweight suit fabric. Apply a narrow band of glue to one inner edge of the ribbon and set it neatly against the opposite long edge, clamping it in place with a paper clamp if possible until the glue dries.Alternatively you can sew the ribbon edges together to form the sleeves for the groom's tuxedo. To fit a tie to a Clothespin doll in a suit or tuxedo, you can use a piece of ribbon or fabric. With the front of the dickey or shirt front glued to the doll, a length of ribbon can be tied as a tie around the doll's neck . Fit the collar edges of the dickey up under the tie before you tighten it around the doll's neck, then fold down the collar edges over the tie and glue the points of the collar to the shirt front. Neaten the tie knot and trim the tie to a suitable length to fit under the front of the tuxedo jacket. To finish the tuxedo jacket for the clothespin groom, two strips of ribbon are folded at the shoulders of the doll and glued along the center back of the doll, along the jacket side edges, and to the front of the doll. You can either assemble an extra strip of ribbon as a notched collar to glue beneath the ribbon edges at the doll's neck, or you can roll the neck edge of the ribbon to form a simple shawl collar as shown. The same method can be used with different colored ribbon or suit fabric. If you wish, you can also trim the back of the jacket longer and trim it to swallow tails for formal wear. Begin by cutting two ribbon strips to the correct length for your jacket. Glue the ribbon strips to the back of the doll so they meet in the center of the doll's back for a jacket center seam. Allow to dry. Turn the edges coming forward over the doll's shoulder to form the shawl collar and glue the bottom section of the ribbon on the right side of the doll to the doll's body covering the bottom of the tie and the dickey. When the glue has dried, run a bead of glue down the edges of the ribbon under the doll's arms and clamp those edges together (or sew them) to form the side seam of the jacket. This step is similar to the assembly of the velvet jacket for the clothespin doll in a kilt if you need to see more photos. Note: you may need to fold the ribbon under at the shoulders or tuck it under and sew it to the back section of ribbon to make a neat shoulder finish. It will depend on the type of ribbon you are using. Finish the jacket by repeating the same steps on the other side, this time wrapping the left front ribbon over the right and gluing it in place to close the jacket. The clothespeg groom can be fitted with a boutonnière or buttonhole spray to match the bouquet of his bride, or you can fit a small section of ribbon (a scrap from the tie) as a handkerchief pouffe. If you wish, you can sew or glue small beads, or buttons made from polymer clay to the front of the groom's jacket. Once the doll is finished, set the legs of the doll into a wooden doll ring stand which has been painted black. The bride and groom can now be posed for the top of a cake or as a table decoration for a shower. As the heads of the dolls are interchangeable if they aren't glued in place, the groom can have a series of bodies for use in child's play.